He had no time to get away and the bull's horns caught him in his abdomen, spinning him over and slamming him back on to the floor. 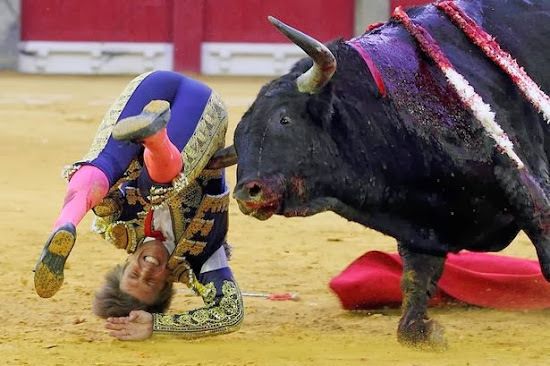 Popular Spanish matador El Cordobes got caught in the crossfire when his star act went horribly wrong. Crowds screamed in horror when the huge black bull turned on the performer with no warning. El Cordobes had no time to get away and the bull's horns caught him in his abdomen, spinning him over and slamming him back on to the floor. Spectators watched in horror as the performer was repeatedly gored in the stomach. El Cordobes was rushed out of the arena as soon as the bull had dropped him, and his pale face showed the agony he must have been suffering. His act was part of this year's El Pilar Feria in Zaragoza, in the La Misericordia bullring. The festival is a celebration in honour of the patron saint of the city, the Virgen del Pilar, and includes competitions, sporting activities and flower offerings.